Uncommon meat and seafood — Lesser-known meat and seafood options are making their way from restaurant menus and local obscurity into mainstream American kitchens. Thanks to heightened awareness around food waste, renewed interest in artisan butchers and a host of other factors, once-overlooked cuts like sirloin top, pork T-bone chop and Denver steaks are becoming fair game for at-home cooks. 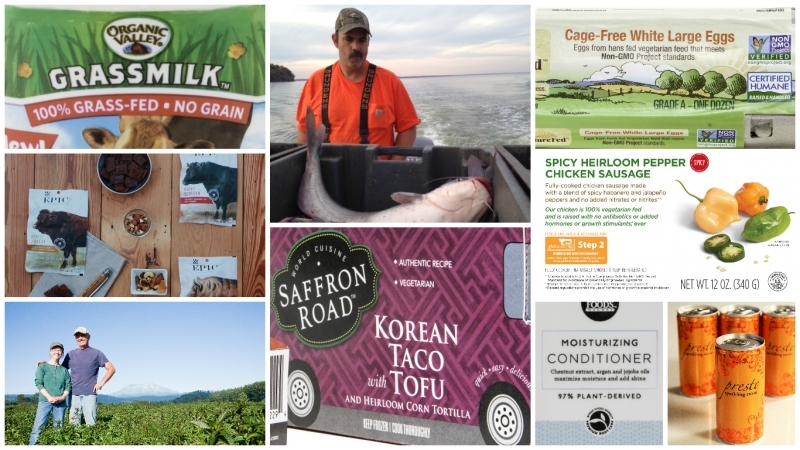 Offbeat – and more sustainable – seafood species like Responsibly Farmed Paiche and wild-caught blue catfish are also making a dinnertime debut, easing pressure on popular picks like salmon, tuna and shrimp. Wine in a can — As American wine drinkers become an increasingly young, diverse and playful bunch, winemakers are taking note. Options that provide accessibility and convenience without trading quality, will continue to gain traction. Cue the aluminum can – a portable, easy-to-chill option that’s well suited for single servings and active, outdoor lifestyles. And with choices like Infinite Monkey Theorem and Presto Sparkling wine (coming soon to Whole Foods Market), today’s pop-tops are the new popped-cork. Plant-based everything — Plants are playing a meatier role in a surprising number of products, and not just for vegan and vegetarian alternatives. This year’s plant-forward movement will be all about harnessing the power of plants – from quinoa protein in hair care products to vitamin-rich veggies in frozen dessert pops. Look out for Whole Foods Market’s™ 97 percent plant-derived hair care line, Kite Hill nut-based cheeses and 365 Everyday Value Fruit & Veggie Bars. Culture Craze: Fermented foods and probiotics — Whether shoppers are seeking gut health or go-for-it flavor, fermented foods and probiotics are growing like good bacteria – and they’re not just for hippies anymore. Fiery picks like kimchi and gochujang will continue to gain steam, while innovative options like chiogga beet kraut and non-dairy tonics will add variety. Non-GMO-fed verified products — As shoppers demand more transparency in their food, the non-GMO movement will continue to gain momentum. Whole Foods Market currently offers more than 11,000 non-GMO verified choices and 25,000 organic options, with even more in the pipeline. Growth and innovation in the animal protein category will be especially strong, thanks to the recent development and approval of non-GMO verification methods for animal feed. Non-GMO-fed verified fresh eggs, chicken, pork and even sausages from brands like Fork in the Road will be worth watching. Graze Craze: Grass-fed 2.0 — With new grass-fed products– from milk, eggs, yogurt, butter and cheese options to packaged meat snacks and even protein powders – sprouting up across the store, grass-fed has proven it’s no longer a niche category for health fanatics or Paleo devotees. Brands to keep an eye on include Sweet Red Cheddar, Maple Hill Creamery, Organic Valley, Kerrygold, and meat-based snack makers EPIC and TANKA. Dried and true: dehydrated foods — Gone are the days of empty-calorie snacking. Today’s shoppers are trading up for healthier, whole-food based snacks with simple, quality ingredients. Unlike the kale chip craze of years past, 2016’s dehydrated trend takes it to new heights – from dehydrated broccoli, Brussels sprout and parsnip chips to sophisticated salmon, bison and chicken jerkies with grown-up flavor combinations. On-trend products include veggie options from Brad’s Raw Foods, Wildbrine Kimchi Crisps and new made-in-house meat jerky at Whole Foods Market. Heirloom ingredients beyond the tomato — Heirloom ingredients are making a comeback and not just in the produce aisle. Prized for flavors and traits that have been preserved for centuries, these “old-world” edibles are popping up in all kinds of packaged goods. Tiny But Mighty Heirloom Popcorn, Madécasse Chocolate made with heirloom cocoa and Seely’s Mint Patties made with heirloom black mitcham peppermint are just a few examples of trending products. Alternative and wheat-free flours — “Alternative flours” are not so alternative anymore. People are going nuts for gluten-free flours made from legumes, ancient grains, teff, amaranth and, well, nuts. Chickpea flour is a quick riser, while other legume-based flours are showing up in bean-based pastas and other packaged goods. ‘Old World’ flavor adventures — “Old World” flavors with a twist continue to see significant gains, especially Far East flavors from Korea, Japan and Southeast Asia, as well as Middle Eastern ingredients. On-trend products include Saffron Road Korean Tacos, 365 Everyday Value Organic Sweet Sabi Mustard (coming soon) and 365 Everyday Value Organic Thai Curry Cashews. This year’s predictions came from Whole Foods Market’s experts and industry leaders, who source items and lead trends across the retailer’s cheese, grocery, meat, seafood, prepared foods, produce and personal care departments, and spot trends for the grocer’s more than 430 stores.